Take your comedy to the next level with Improv 2! 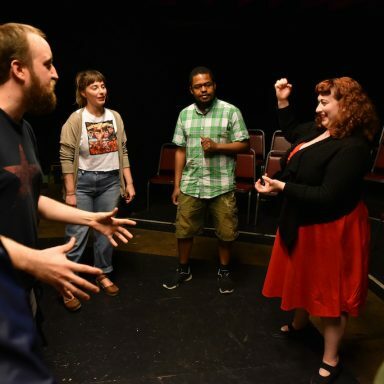 Our Improv 2 class pushes students to further explore the dynamics that drive a scene by studying how to create characters on the fly, the straight/absurd relationships between characters, and the concept of “game” that exists in most comedy scenes. The class will be held at the theater located at 616 Lavaca Street in downtown Austin and will contain 8 weekly classes on Tuesday evenings 6:30-8:30pm starting Tuesday, May 28th. Students will also perform a Sunday night class recital show at the end of the course. Payment plans are available where students pay the first 1/2 of tuition by the 1st class, and the second 1/2 by the 4th class. If you would like to inquire about a payment plan please email classes@fallouttheater.com.